Former Sonics owner Howard Schultz, of Starbucks fame, is suing Mr. Bennett’s group to strip them of ownership, arguing that Mr. Bennett reneged on a promise to negotiate in good faith for a new arena before trying to relocate. 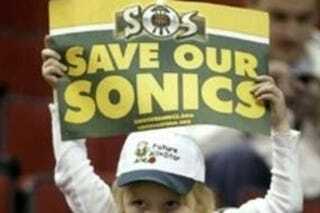 If Mr. Schultz prevails, the Sonics could potentially be forced to return to Seattle — Mr. Schultz and his lawyer aren’t seeking an emergency injunction to stop the move in hopes of building a better case, and that case isn’t expected to go to trial for nearly a year. "We made it," Bennett said after stepping to an Oklahoma City podium featuring the NBA logo and the letters OKC. "The NBA will be in Oklahoma City next season."